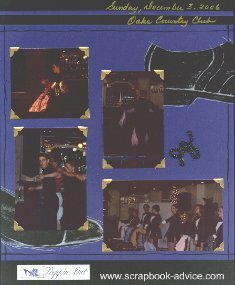 Our Ballroom Dance Scrapbook pages were put together for our 12 x 15 inch Album using 12 x 12 inch papers from the beautiful Club Scrap from the November 2004 Kit called "Steppin' Out". So here are some 12 x 15 scrapbook layout ideas to "stretch" your 12 x 12 inch layouts. 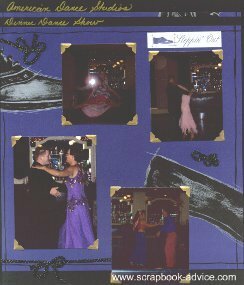 This great kit of Black, Royal Blue and White Glossy Card stock had wonderful images of Mens and Ladies Dress Shoes and the traditional ballroom dance step patterns as you can see below. Scrapbook-advice.com Tip: Here's another 12 x 15 scrapbook layout idea to extend the 12 x 12 inch paper printed paper to 15 inches tall, each background page has been cut through the middle on the horizontal or corner-to-corner with an added strip of coordinating color to make the paper 12 x 15 inches tall. Here, this was done by adding one large strip of a different paper, but it could also be done by adding several smaller strips of paper. 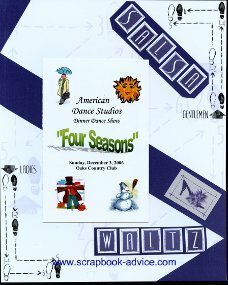 Titles with the Dance names of Salsa, Waltz and Tango were made from strips of the Royal Blue and Title Letter Squares that came with the kit. 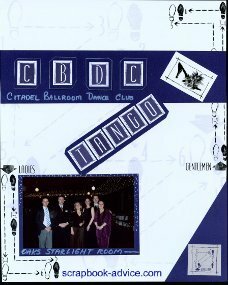 Each of the letters for the CBDC - Citadel Ballroom Dance Club, were placed on the Royal Blue Card stock tiles which were the edged with White Ink. Scrapbook-advice.com Tip: Note the Traditional Ballroom Dance Step Guide on the corner borders of the paper and on the embellishment square in the lower right. You could use a number of these to accent each individual dance. They can be small and put around the border - in the case of trying to make your layouts 12 x 15 inches, they can be used to accent the top or bottom when using 12 x 12 paper. The Brochure from the evening also highlights the page as we only had one other photo for these layouts. Scrapbook-advice.com Tip: For these 12 x 15 scrapbook layout ideas, each of these background pages of Royal Blue background card stock was edged at the top and bottom with a strip of black to make the layout 15 inches tall. The black was also present in the pattern on the paper. A thin strip of the royal blue was added to the center of the top strip and used to divide the original Journaling done with a Gold Metallic Pen. To match the Gold Metallic Journaling, Gold Metallic Photo Corners were used to frame each of the photos. Other embellishments on the page include two Journaling Blocks with Mens and Ladies shoes and "Steppin Out". To top off the layout, a fiber that came with the kit - black fiber with purple and turquoise iridescent flecks was used in various places on the layout. This helped to add to the formality of the layout. Scrapbook-advice.com Tip: Some other ideas for a Ballroom Dance Scrapbook included some interesting photos and facts about purchasing just the right shoes. Then there were a couple of layouts on the making of the costume - from picking the fabric and embellishments, to matching it up to the partners costume and making it appropriate for the particular dance and story being told with the music. We even included some of the fabric on that one. We hope you have enjoyed our Ballroom Dance Scrapbook. We did not show more layouts as we do not have permission to post photos that will clearly show the individual participants, but hopefully these few layouts will give you some idea of ways to stretch a 12 x 12 inch paper to use in a 12 x 15 inch scrapbook. Check out our Scrapbook Photo Album Page for other examples of 12" x 15" layouts.